“Mindfulness” is one of the nice words in today’s time. 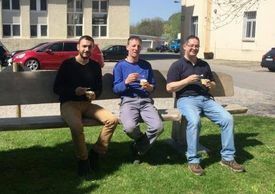 Mindfulness became a very important part of our company’s philosophy because it demands not only to do things carefully but it also means to pause, take a look on the left and right, on the environment, to notice the own doing. Mindfulness describes perfectly the holistic approach with our work at disana. For those who can work and live in a rural environment like us, it’s an absolutely basic instinct. Now in May flowers are in bloom in the nicest colours on the pasture right towards our headquarter office. Blue cranesbill, purple carnations, yellow buttercups and white yarrows are some of the spring flowers on the Swabian Alb. Apple and pear trees of the meadow orchard are blooming between them. And really the air should be filled with buzzing bees that refresh themselves from this nature’s treasure. But also we notice the decrease of insects. You have to search a while to find a few bees in this ocean of blossoms. The unbridled use of insecticides in agriculture, the land usage and the mite infestation burden the bees massively. It’s questionable how the development of bees continues, which also affect our nutrition. Orchard pedagogue and beekeeper Birgit Wester counteracts with her apiculture “BienenElfe” (engl. bee fairy). The beehive of the honeybees for delicious “fairy-honey” is right next door in the neighbouring “Heutal”, where the meadows are still farmed very natural. There is enough pollen for the busy bees which they collect the whole summer. 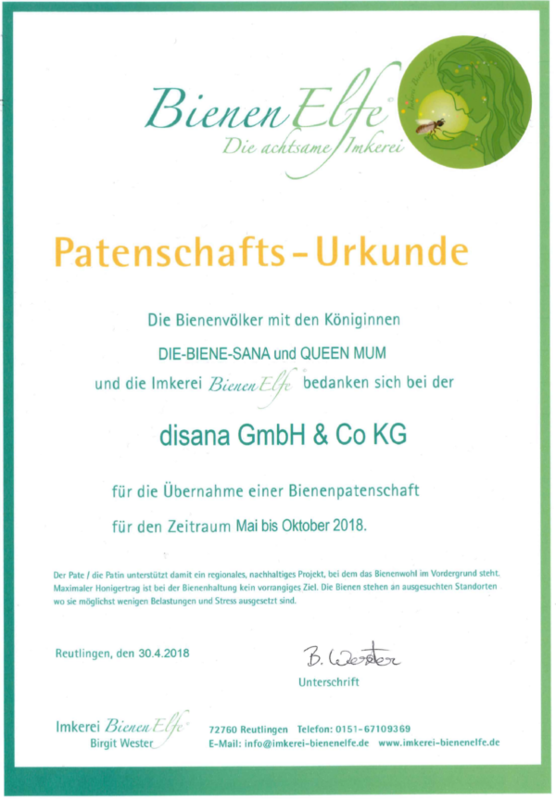 Of course we accepted to assume a sponsorship for two bee colonies when Birgit Wester asked us. And we did that not only because of the delicious honey that we get at the end of the 6-month flying season. We could also choose the names of both queens from the two bee colonies. It was a joint project which took a few days here at disana. We called the Royal Highnesses “Die-Biene-Sana” and “Queen-Mum”. We’re happy about looking on the left and right with mindfulness and to have found a small project for which we can do something for the nature and its treasures beyond our daily work. And sure we’re looking forward to the first honey bread with honey from our bee colonies. The extensive regulations with the Global Organic Textile Standard (GOTS) include diverse job safety measures. Disasters like the collapse of the Rana Plaza building in Bangladesh have an impact on our work according to the GOTS. That's why fire drill and evacuation exercises belong to job safety measures. 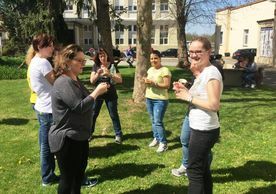 Two weeks ago, a sudden alarm for evacuation rang out and it took only 3.5 minutes for all workers to get out of the building. Fortunately it was only an exercise. 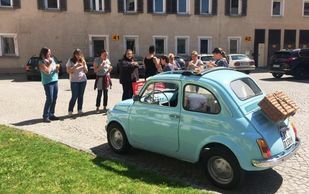 By chance the CEO's Oldtimer parked outside with ice-cream on its engine bonnet for each worker. :) This was a welcome opportunity to cool down after the fright of the alarm. 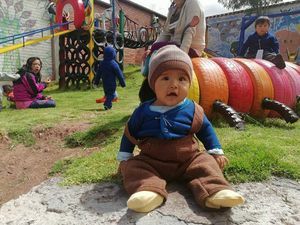 Like last year we supported the Casa Mantay in Peru, where unwanted pregnant find a safe violence-free place. The young mothers there are very happy each time when they receive out clothes for their babies and children. From time to time we get calls for help but unfortunately we’re not able to help in each case. The Casa Mantay is the project of our hearts, these amazing pictures speak for themselves. Fashion Revolution - Who made my clothes? On April 24th in 2013 the Rana Plaza building in Bangladesh collapsed and many people died or have been hurt. 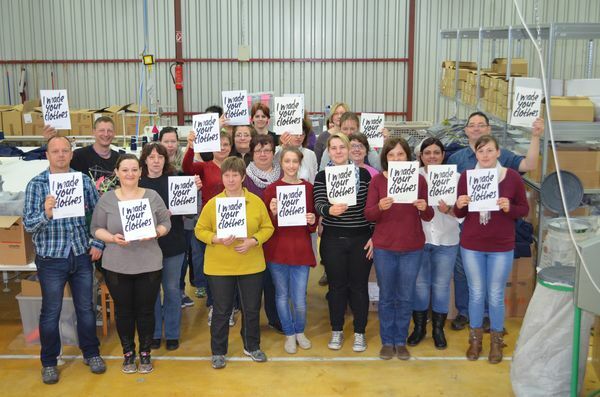 This disaster pointed out the inhumane working conditions in the textile industry. 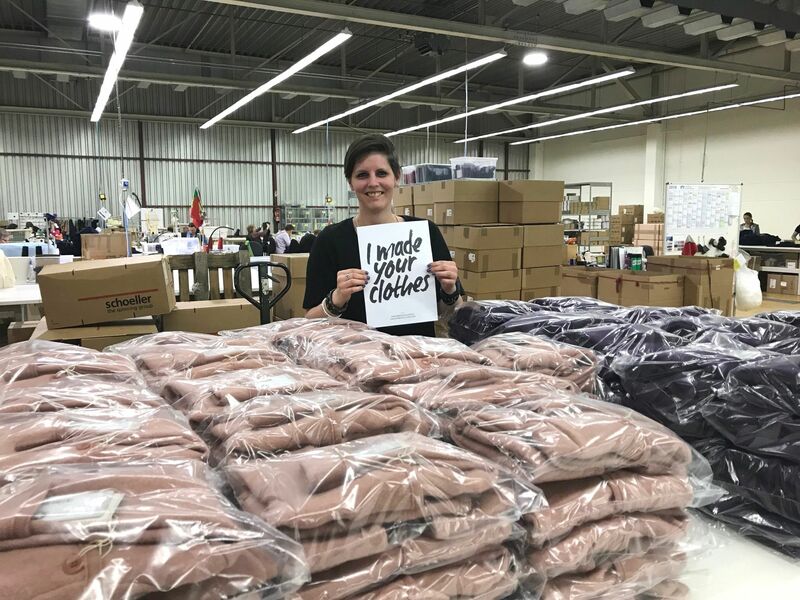 It's not about forbidding our customers to buy their favourite non-sustainable clothes, but each and everyone of us can make the world a little better by looking carefully and questioning where and how our textiles are produced. 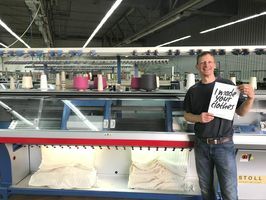 We are proud being able to say that all our clothes are produced sustainably and under fair conditions at our own production facility in Germany. We stand for more transparency in the textile industry! A very important part of our production is the "cutting department". 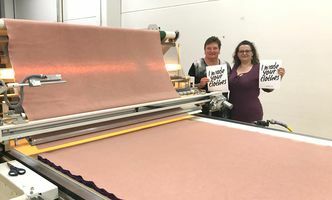 There we cut our fabrics for the sewers. Until now we did this with cardboard templates but this is now the past because we got a new cutting machine. 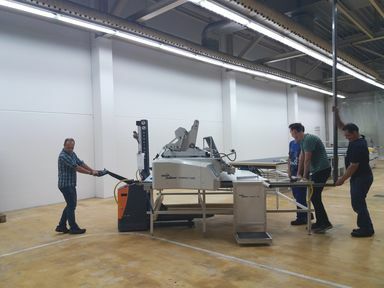 With this machine we can digitize our cuts, achieve a better matching accuracy and reduce waste residues. With moving the cutting department to a larger space, everybody had to help out. Also Moritz, son of our CEO and man for all jobs at the moment. 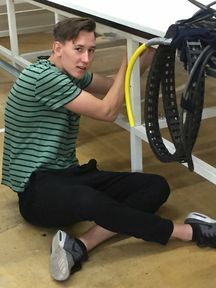 On this picture you can see him fighting against a stuck bolt. Moritz was already a part of the first steps towards fashion from disana. As one of our first models for the former small disana catalogue. That was 18 years ago. Time really kept flying by like nothing. 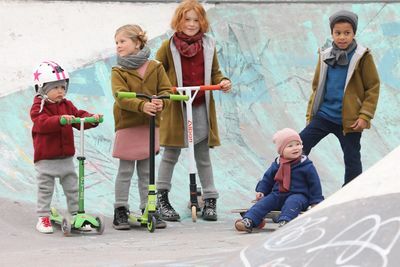 Back at office we want to share with you the INNATEX panel discussion with its topic "Baby and Kids clothes - why eco friendly textiles are that important for the little ones". 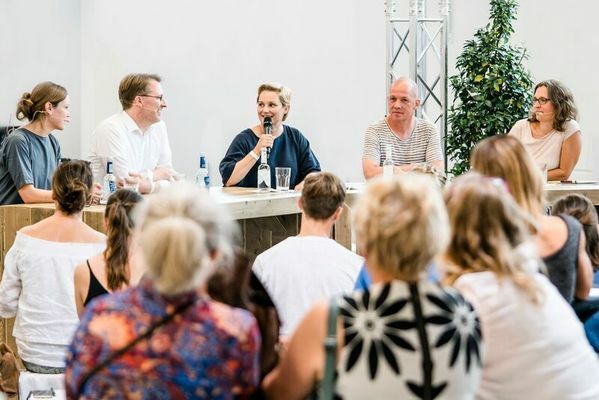 Our CEO Elmar Sautter participated in this discussion together with Dr. Kristin Stechemesser from the Federal Environment Agency, Martin Paff the publisher of the magazine Childhood, Patricia Taterra from Hug&Grow and the German journalist and moderator Janine Steeger. 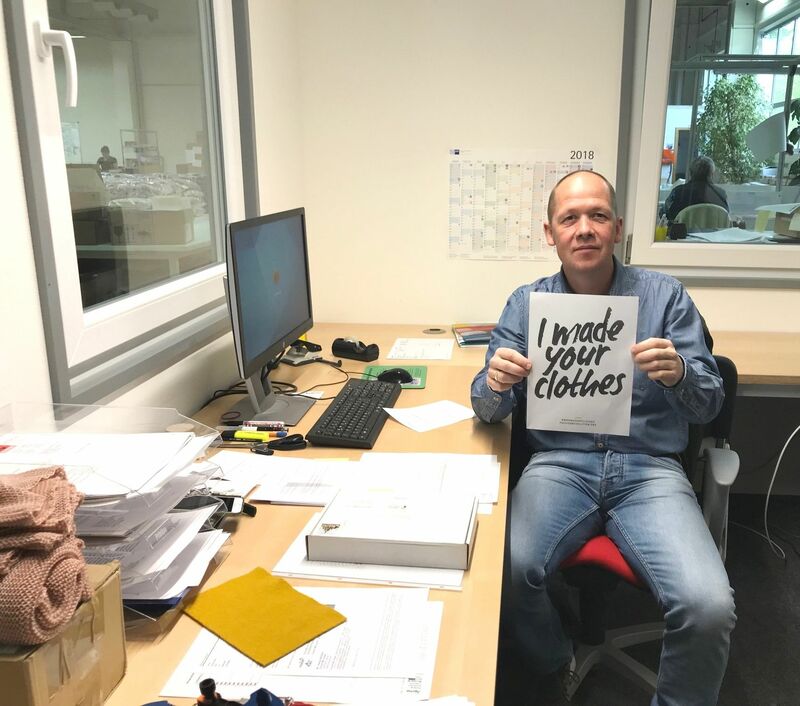 On the occasion of the Fashion Revolution Week end of April, also we at disana think of the victims of the Rana Plaza factory collapse in Bangladesh 4 years ago. 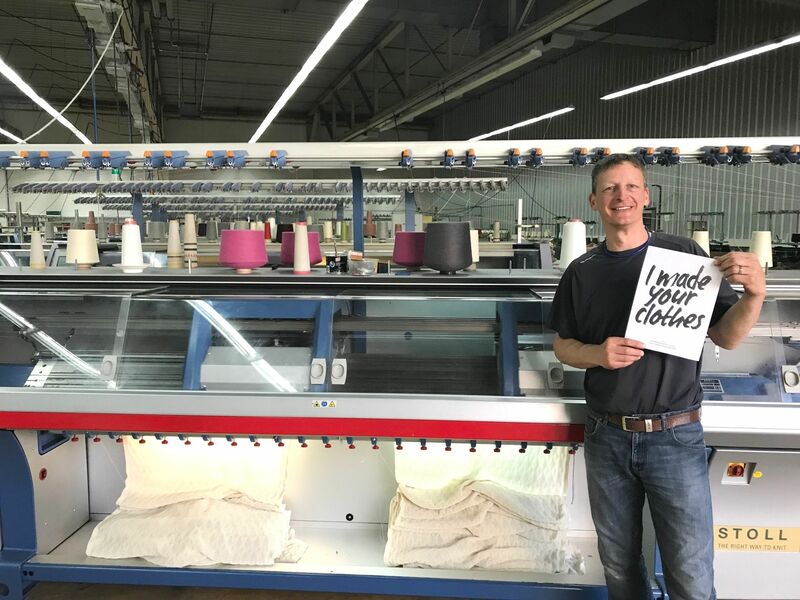 To show what a fair production means, we took a picture of our precious employees in the South of Germany, who produce your disana clothes under fair and nice working conditions. Ask the brands where they produce, be curious, find out, do something! 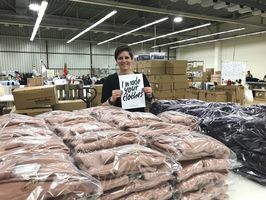 Buy fair and sustainable produced clothes. It's never too late for a change! disana stands for more transparency in the fashion world! Last year in December some of our products travelled to Peru. Mrs. Weiland welcomed our donation for the Casa Mantay. 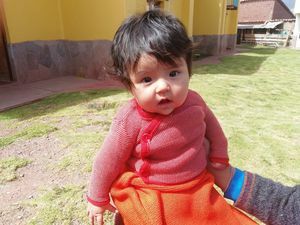 The Casa de Acogida Mantay in Cusco (Peru) is a sanctuary for unwanted pregnant girls. The situation for women in Cusco's department in Peru is disastrous: 61% of the women in this region report from experiences of psychical violence on the part of their men and 47% report from sexual violence, which means that 2 of 3 women suffer from physical or sexual violence. The Casa Mantay was founded in 2000 and helped over 200 underaged women and their children until today with offering them a temporary home. The women are over a life of suffering with psychical and physical abuses. 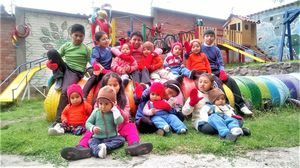 The Casa Manty offers this young mothers and their children an unequivocal support - from a home and food, school education, psychical and legal support through to finding an independent way into a normal life. The association Mantay Peru e.V. Germany serves for sponsorship and support of the Casa Acogida Mantay. The donations run directly into the sections social development and integration, education, health care and capacity building. The Casa Mantay is a part of the Asociación Qallariy, Proyectos para la Ayuda al Desarollo - an association which is approved charitable according to peruvian law. 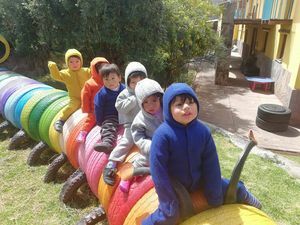 The pictures show the children in the Casa Mantay, wearing their new disana pullovers.